Don’t let the cute theme fool you. 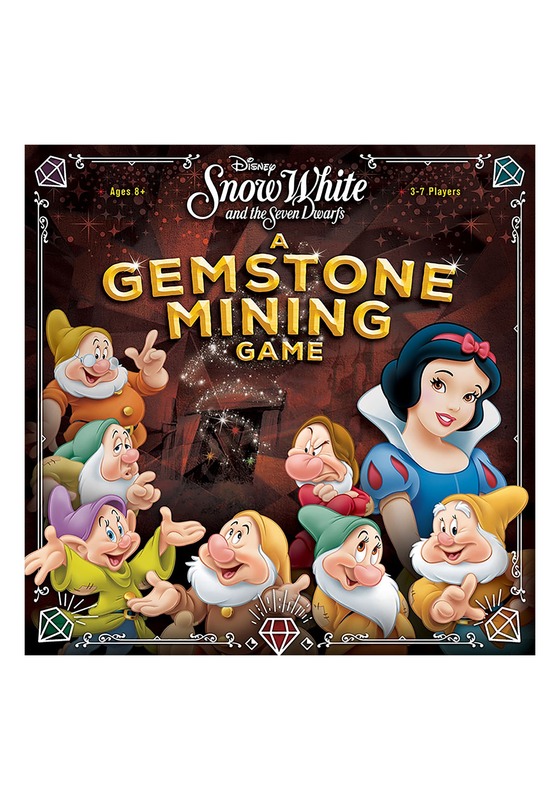 Snow White: A Gemstone Mining Board Game can get intense. It might be based on the classic Disney film, but being a dwarf working in the mine can be a cutthroat business. After all, Snow White is paying some serious points for certain gem combinations and you don’t want to be stuck with a big pile of obsidian when it comes time to collect your points! The game comes with cards, a game board, player boards, victory tokens and plenty of fake gems. Gameplay is simple. You can either play a card from your hand, mine a gem, by blindly pulling a gem from the bag, or you can leave the mine and collect your points. Snow White will even give you special bonuses for collecting certain combinations of gems. Get stuck with too many obsidian pieces and you’re out of the round and you get zilch. Zero. Nada. Of course, the competitive nature of this game comes in the form of the cards. Some cards will have you stealing gems from other dwarves, or swapping their high-value diamonds for dangerous obsidian that can get you kicked out of the round. The game is recommended for ages 8 and older and we recommend that if you play it with younger players, you should definitely have a talk about the competitive nature of the game to avoid some heated arguments!